Our parent company, Van Wagner Group LLC is a leading Sports Marketing & Entertainment company. We specialize in connecting brands to consumers in a high-impact, memorable fashion, and our national aerial advertising services are second to none in this category. 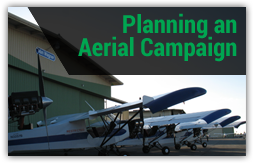 With over six decades of experience, and planes in markets across the country, we are by far the most knowledgeable and capable aerial advertising operator in the industry. Why Choose Aerial Advertising At Sporting Events? Aerial advertising at sporting events is hands down the most impactful, and cost-effective way to reach a massive amount of people at one time. With a 70% rate-of-recall, Aerial Media is the most memorable form of traditional advertising. Thousands of people flock to stadiums and arenas for pre-game tailgating activities. NFL, MLB, MLS and NCAA games, as well as NASCAR races, and surfing competitions, draw thousands, sometimes hundreds of thousands, of people to one event. 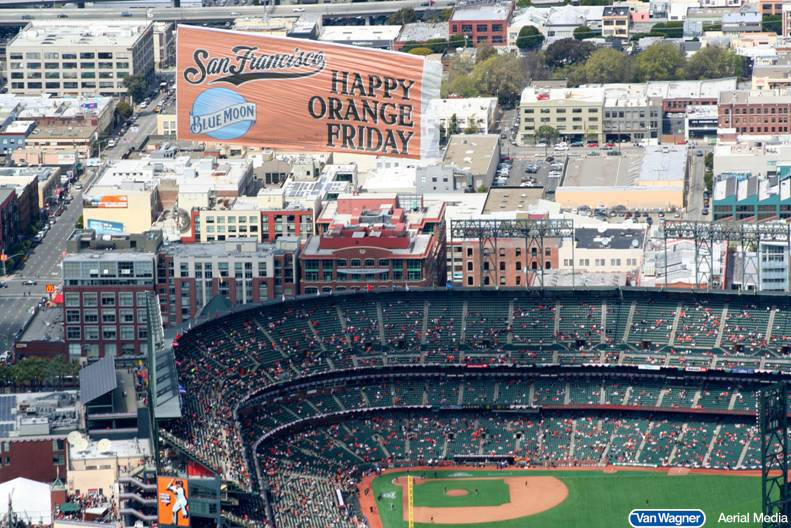 By flying your aerial message in the hours prior to the game, you will reach a large captive audience when they are most receptive to seeing your ad. We offer our clients the option to switch out their messaging by using a snipe, or removable piece of banner copy. 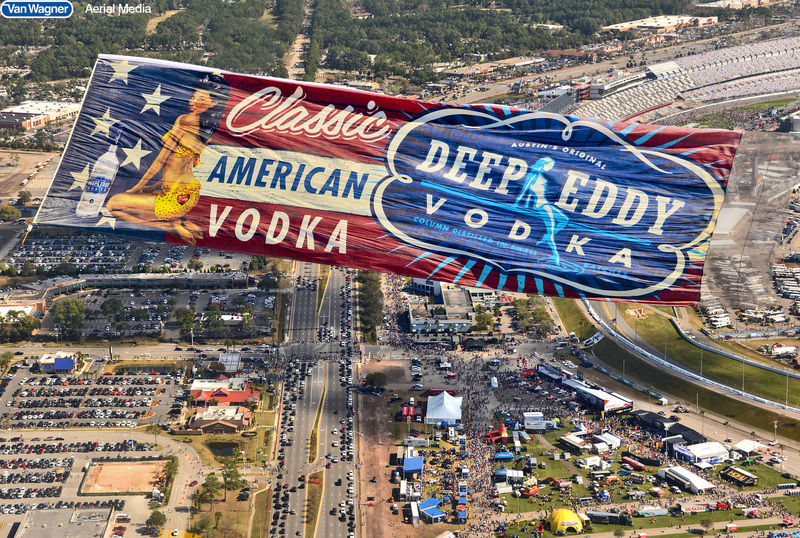 Your aerial ad’s copy can change from stadium to stadium, allowing for a more targeted message. For the most part, advertisers flying above stadiums do not need abide by the stadium’s regular advertising rules and regulations; this gives your brand the freedom and creativity to capture the spotlight. Aerial advertising at a sporting event is a great way to imply sponsorship without paying for the official relationship. Professional football is the most popular sport in the country, with an average attendance of over 67,000 fans at every stadium. To give some sense of scale, 114.4 million people tuned in to watch the Super Bowl, and over 100,000 attended the event itself. Amidst the tens of thousands of screaming fans who attend sporting events of all kinds, aerial advertising is the only way to grab their attention. By choosing NFL airplane advertising you can fly your aerial banner over and over again at the biggest games of the year, reaching hundreds of thousands of people from above. Baseball is the oldest sport in the country and the second most popular sport in America. With 161 games each season, the MLB has the longest season of any professional sport. With an average attendance of over 30,000, what better way to target a captive audience than with MLB airplane advertising? NASCAR is one of the most popular sports in the country and provides an ideal setting for aerial advertising. Racing stadiums have the largest seating capacity of any sports venue: the Indianapolis Motor Speedway boasts an impressive capacity of 267,925 people. Imagine your aerial messaging (blimp, banner, or sky writer) circling the stadium with your brand boldly standing out above hundreds of thousands of ecstatic fans. College sports have a huge following, with die-hard fans supporting their favorite football and basketball teams every year. The College Football National Championship game had an attendance of over 85,000 fans, while the NCAA Men’s Basketball Championship game boasted similar numbers. NCAA banner advertising is an effective and reliable method of reaching thousands of fans who eagerly pack stadiums to support their favorite team. Interested in giving your brand exposure at some of the nation’s most popular sporting events? Contact us for your free quote today! Interested in learning more? Download our free guide!